From warding away evil spirits to catching shoes, the history of bridesmaids is full of surprising (and kind of scary!) traditions. 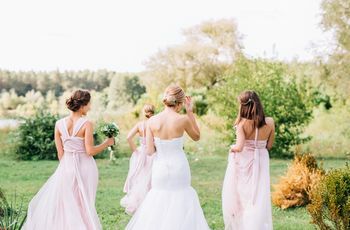 We all know that bridesmaids serve an important role—planning parties, wearing a (hopefully) pretty dress, and standing by the bride’s side at a wedding, However, you might be surprised to learn that according to the history of bridesmaids, the job wasn’t always so glamorous. In fact, the role of bridesmaid has changed greatly since the early days of weddings. 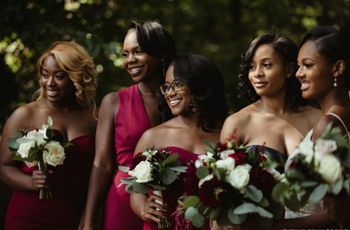 You may be surprised at the breadth of bridesmaids’ responsibilities in olden times, and relieved that even though the checklist of bridesmaid duties might seem long, modern 'maids have it pretty easy in comparison. Whether you’re an old pro or a newbie, it’s helpful to learn the history of bridesmaids to compare the past to the present. Bridesmaids have always “served” the bride. 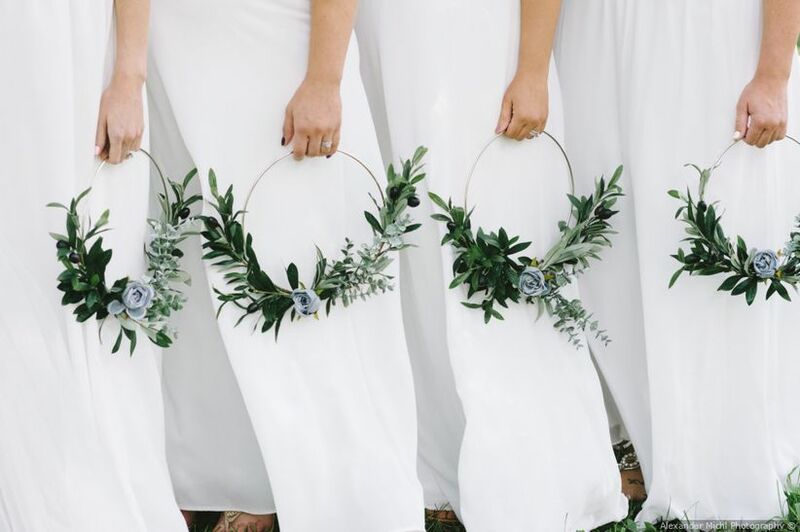 When it comes to the history of bridesmaids, one of the most well-known origin stories comes from the story of Jacob in the Bible. His two wives, Leah and Rachel, were escorted to the wedding by their own servants—the brides’ maids. Back in biblical times, bridesmaids were not necessarily friends or relatives, they were actually domestic workers who catered to the bride’s every need during the wedding day. 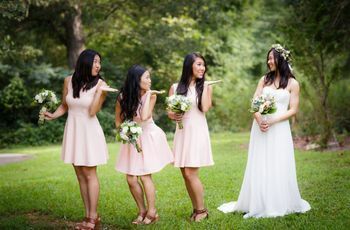 Obviously, while bridesmaids still assist the bride before and during the wedding, they are chosen because of their close relationship and friendship with the bride, not because they work for her! You might think helping your bestie use the bathroom is a tough task, how about risking your life for the bride? During the early history of bridesmaids, ‘maids were tasked with not only attending to, but also protecting the bride from evil—whether that meant spirits or bandits. In ancient Rome, it was believed the bad spirts would descend upon weddings so bridesmaids wore similar outfits to the bride to confound the evildoers. And in many cultures throughout history, brides presented their grooms with a dowry of money, furniture, and other riches, which made them targets for robbers (and exes!). Again, bridesmaids served as “decoys”, so that said bandits wouldn’t know who the actual bride was. A maid of honor has always been the bride's right-hand woman. Traditionally, a maid of honor is a type of attendant to royalty, so it makes sense that it’s also a term to describe a chief bridesmaid. Long ago, the maid of honor was considered the bride’s “favorite”, but this meant she was basically at her beck and call in the weeks leading up to the wedding. And maids of honor were responsible for carrying the monetary portion of the bride’s dowry—putting her at great risk to thieves and other evil-doers. Nowadays, a maid of honor's duties include planning pre-wedding parties and serving as point person on the wedding day—not exactly life threatening work! Bridal showers were all about the money. Throughout the history of bridesmaids, one of ‘maids’ biggest responsibilities is planning the bridal shower. At these often female-only parties, women “shower” the brides with gifts, play games, and enjoy food and drink. However, many years ago, these bridal showers were a way for a less-well-off bride to collect dowry money from loved ones. 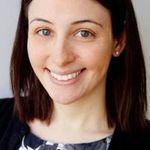 This may be because her own family didn’t have enough money to contribute to a dowry, or because her family did not approve the impending marriage. These days, bridal showers are much more lighthearted affairs to be sure. A bridal party no longer has to be all-female. Until recently, wedding parties were divided by gender. Women were appointed bridesmaids and men groomsmen. These days, couples are choosing wedding party members based on their relationships, not outdated rules. 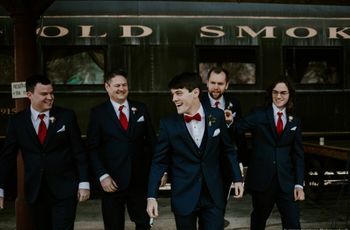 Bridal parties consist of bridesmaids, bridesmen, maids of honor, and men of honor, while groomsladies and best women may be on the groom's side. This makes a wedding party far more personal to the couple. Bridesmaids dressed alike, often in white. Back in olden times, bridesmaids wore similar dresses to the bride, frequently wearing veils to cover their faces. This may have stemmed from Queen Victoria at her 1840 wedding to Prince Albert, where she and her attendants all wore white. As time went on in the history of bridesmaids, the main goal of bridesmaid attire was not to outshine the bride. In this first half of the 20th century, bridesmaids were frequently bedecked in hats and gloves; later on, puffy sleeves and shiny satin were de rigueur. Moving into the 21st century, brides became more keen to let their bridesmaids choose their own dresses and mix and match styles. Bridesmaid dresses these days are more fabulous than frumpy. And what’s old is new again: White bridesmaid dresses are totally in fashion once again! Bridesmaid bouquets weren’t always so pretty. Why do bridesmaids carry bouquets? There are lots of theories, but back in olden days, bouquets were less about color and style and more about function and superstition. Bridesmaids carried fragrant herbs, even garlic, to ward off evildoers (and perhaps to mask their own body odor since bathing was not a daily occurrence). Later on, again inspired by Queen Victoria who carried a small bouquet of her favorite flowers on her big day, brides and bridesmaids started carrying floral bouquets. And though the tossing of the bouquet might be a tradition that single ‘maids dread, you might be surprised to learn about its origins. A bride used to throw one of her shoes to the waiting crowd of bridesmaids­—ouch!